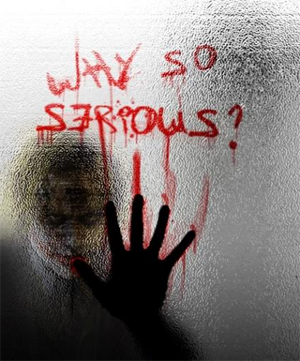 "Why so serious?" … this question thrills me again and again, especially when the great and now 'late' Heath ledger uses it as "The Joker" in the movie - 'The Dark-Knight'. After the movie was released, this character not only fascinated the youth, but also boosted the local 'mafias' who aspire to become a great criminal. The Joker lives a character that is unconventional in every aspect of his life and his deeds; moreover his smile could kill a small baby. 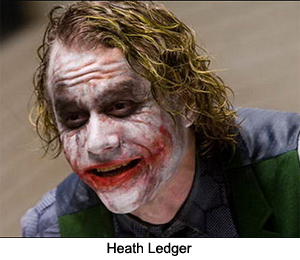 The Dark Knight's Joker, as portrayed by 'Heath Ledger', is one of the most interesting villains of recent Hollywood cinema. While a great deal of praise has been leveled on the character and his portrayal, not so much analysis has been performed on the character itself. The Joker's back story is never truly explained, which is interesting in itself as the Joker basically came from out of nowhere as though a force of nature rather than a human being. The Joker himself gives a few explanations as to his history, but each of them is essentially a lie about some sort of failed family unit. Despite this, there are some conclusions which can be drawn concerning the Joker's back story by judging aspects of his personality and appearance. The first is that the Joker was at least once the victim of a gang related attack as the smile cut across his face, called a Glasgow Smile, is associated with gang related activities. This suggests that the joker either was himself in a gang or was the innocent victim of a gang attack. The second aspect of the Joker's back story that can be ascertained is that he had poor family experiences. While both of the stories he tells are lies, they both include family tragedy as aspects of that lie. This suggests that he has some sort of family-related trauma in his past. Now the question arises - What does 'The Joker' represents? The Joker really represents 'The Dionysian' (Pronounced as - 'Di-uni-sus', a synonym used for the Greek God 'Bacchus, the God of alcohol and wine'), the underlying savage nature of humanity. However, rather than being a typical villain that simply represents the Dionysian, the Joker is aware of what he represents and seeks to show Gotham City that they are actually all like him underneath it all. Thus, all of his actions in the Dark Knight are actually trying to show Gotham how evil they truly are when the rules of society are no longer of benefit to them all. Due to this, the Joker actually gets defensive when he is called crazy, defending the validity of his views and even getting visibly upset when they are proven wrong towards the end. The relationship between batman and the joker is that they both work outside the laws towards a goal, as well as adopt a theatrical persona to head towards achieving that goal. The difference between them is that the Batman aims ultimately to restore order and law to Gotham whereas the Joker aims to completely free it from it and expose Gotham for what it really is. In a way, the Joker was actually created by Batman as before him the theatrical concepts did not exist. The underlying theme is that Batman's presence in Gotham rids the city of some crimes, but attracts a different sort of criminal. There is no exact origins story given for The Joker in The Dark Knight. Other Batman tales show how he became what he was. The Joker himself offers various accounts (“You wanna know how I got these scars?”). But the Joker exists for the same reason that I couldn’t simply write an article on Batman alone: The Joker needs Batman. Without Batman, The Joker wouldn’t be able to derive enough joy from the world. Bats is like his toy, a force of good that strives to heal the world while Joker thrives on the bottled chaos that flows in the subconscious of the civilized human. It could even be argued that Batman needs The Joker. Not Bruce Wayne, but whenever The Joker is around Batman cannot retire. Anyways it is this chemistry between the two that makes their tales so compelling. I mentioned Batman’s uncompromising moral code, but it seems that is the very thing that continues to feed The Joker’s motivation. In The Dark Knight he forces Bats into torturing him, enjoying every minute of it – at least as much as you can while being pummeled. He baits Batman to kill him, to break his purity. He obviously fails. Bats isn’t Gotham’s Dark Knight for nothing. But if he can’t defeat the Bat then maybe he can defeat the people. The ones Bats is fighting for. The mass exodus of Gotham, after threats from the Joker, leaves two ferries broken down in Gotham River. One with criminals and one with citizens. Both rigged handsomely with explosives and the triggers in the hands of the other boat (chaos is a complex game to play sometimes). But the people of Gotham, though quick to panic when provoked by Joker, still have a conscience. The one that inspired civilization and law and order in the first place. The one that Batman hopes to inspire. The one that Batman will always believe in. In the end, both the Joker and Satan are set back. Decency emerges in difficult times as the would-be victims refuse to blow each other up and Job maintains his innocence, refusing to curse God for his misfortunes. These parallels serve as a solid understanding for not only the otherwise mysterious motivation of the primary villain of The Dark Knight but also the question of human morality that rests at the core of the film. I personally believe that 'The Joker' lies somewhere or the other in all of us, it is just a matter of fact that the movie has so well driven and carved the best out of it, I mean one can only understand the best part of Joker's portray if one has felt the darks of the society. I mean it is an inner insight which drives you crazy when you are too much suppressed with negativity, and even 'negative' is some energy which might be great at times, and sometimes even better than 'the positives'. The Joker is a legendary character, I really felt choked when 'Heath Ledger' died, he also got an academy award for his legacy. Madness is like 'gravity', all it takes is a little push! "I believe whatever doesn't kill you simply makes you stranger." hello sir....i wanted to knw 1 thing dat wat do uh mean by dis statement of urs...."even 'negative' is some energy which might be great at times, and sometimes even better than 'the positives'." You have very well described the relationship between 'Bats' and 'Joker'. I too was shocked to hear when Heath Ledger passed away.